Great tutorial, Gigi and I can’t wait to see you wear your finished dress! I envy you this one, for even with cups inside, I still don’t think I could pull this off! Some people just should not go strapless and I think I am one of those people! Thanks Gigi for sharing this tutorial. 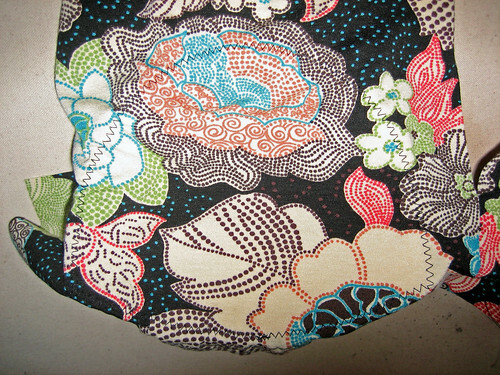 I am looking forward to see your finished halter dress. Thank you for this very useful tutorial! I’m also looking forward to see your finished dress! I really like this idea! Do you mind if I put a link to this on my blog? Thanks so much for this tutorial Gigi! I’ve bookmarked it! That’s a wonderful tutorial! There are so many beautiful patterns out there that I don’t make because I have having my straps show, or the backs are bare, etc. That would be a great solution. Thank you so much! Holly, please feel free to link away. I love your blog! That’s a *great* idea, Gigi! Does the dress fit snugly enough to, um, hold the cups in place? Great idea, Gigi.. I was actually just reading about doing this last night in the latest issue of Sewing Stylish. 2 questions… where do you get your bra cups from and also, what is a trolley needle? Simply wonderful, and timely tutorial, Gigi and I love your hot new dress! What a brilliant idea! The dress looks fantastic and I love your website. I think I’ll be using this idea. I also hate the look of bra straps and the clear straps you can get now seem to loosen up over not a lot of time (less than an hour). Thanks for the tutorial! 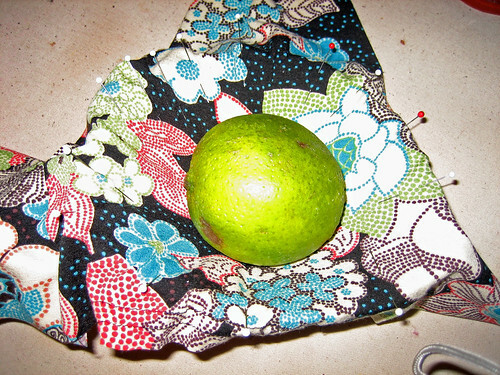 Gigi – a limes a sewing tool is – brilliant! Thank you for the tutorial. 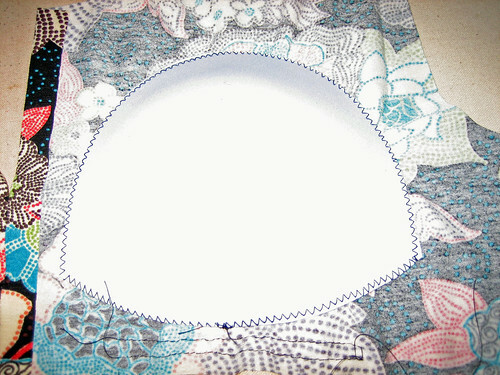 I was trying to figure out how to do this myself for my dd and you have saved me a huge amount of time, effort and most likely a lot of innocent fabric. I don’t know if you remember, but you helped learn how to grade a pattern about five years ago, via e-mail. My dd said to tell you thank you (said in a heart felt tone). 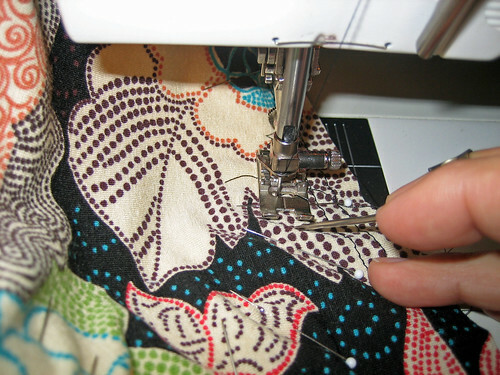 This post totally makes me want to sew! I also mentioned it to my 17 yo and she really liked the idea. Are you the same Joy Holmes that works for VSM Group? Wonderful tutorial..now just help me find the bra cups! I need C and D cups. Where do you find these cups?? Great descriptions! 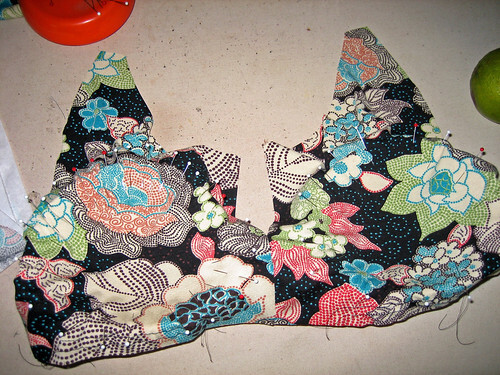 Would this work for a swimsuit, especially a swimsuit to which a pocket for a partial prosthesis must be added? It would have to be secure enough for the prostesis made of silicone to stay in place by being held firmly against the breasts and not slipping down and folding and also by not slipping out of the pocket. Can’t find a masectomy swimsuit that is small enough in the ribcage while also being a D cup. Haven’t swum for three years because of this since my lumpectomy. I just used this technique in a dress I made. Thank you! It worked out really well! I found my bra cups at Jo-Anns, and they were for a B/C cup size. where do you find these cups ? If you look at some RTW camisole tops with bras inside, they either have the bra cups sewn into lining and then the back of the garment has either the back lining with added support with elastic at what would be the back bra line or have an actual bra back with bra hook. 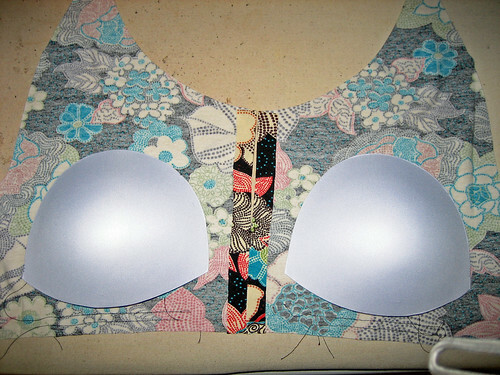 The camisole is very snug to have the breasts stay in place. One issue I have with making one of these is finding the exact proper size cup and getting it to fit snuggly enough so I don’t “flop around”. Having yo-yoed in weight in my life, my breasts are fuller in the bottom and flatter on top….hard to fit. I have bought dozens of these in camisoles in various colors and then added all kinds of trims, sequins, rhinestones, etc.. I have also bought heavy lace bras and sewn them into dresses as I found this easier than actually constructing a bra from scratch (being a 32D….maybe if you are a flatter girl this might be easier). Probably this would be easiest to make with any fabric that has some lycra to allow it to conform to the body (like my camisoles have lycra in them).